Norton Creek Press, September 2008. ISBN 978-0-9721770-8-5. 176 pages. Suggested Retail price, $17.95 (Kindle $4.97). Ten years after Henry David Thoreau learned how to be a poor farmer, Edmund Morris learned how to be a good one. 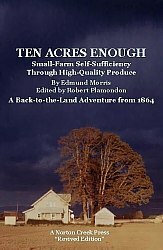 Ten Acres Enough is the personal story of how Morris quit the publishing business and achieved happiness and prosperity by farming ten acres of fruits and berries. Rather than glorifying poverty and isolation, Ten Acres Enough shows farming as the path to financial security, while still providing all the benefits of country life—provided that the farmer understands that the key lies in producing crops of the highest possible quality, while living within striking distance of a major market. Ten Acres Enough has left its mark on generations of back-to-the-land farmers. Its influence on both the title and the contents of M. G. Kains’ classic Five Acres and Independence (1935) is obvious. And it is benefiting readers today, whether as a piece of Americana or as a source of small-farm ideas and inspiration. Through nearly 150 years old, Ten Acres Enough remains a fascinating book. However, the passage of time is making the original edition increasingly inaccessible due to its archaic vocabulary and style. I have copy-edited this “Revived Edition” to restore its clarity. I have also removed needless repetition, added footnotes where necessary (all footnotes are mine), and provided inflation-adjusted prices in addition to the originals. I think Morris would approve. Where To Locate: East Or West? Read a simple chapter: My Second Year. Buy on Amazon or see our How to Order page.